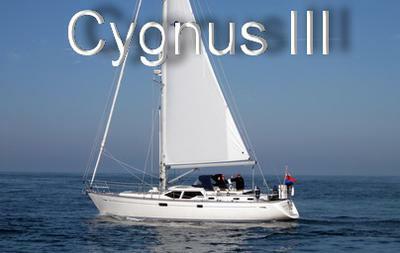 Cygnus III is an Oyster 45 designed by Holman and Pye. 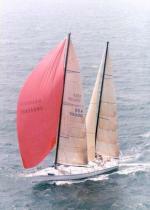 She was built in 1996 by Landamores in the United Kingdom and launched in 1997. Conceived as a replacement to the extremely successful Oyster 435 the Oyster 45 benefits from the experience of building sixty five of these fine boats. 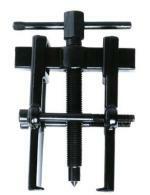 She provides improved performance and accommodation. With three double cabins plus the saloon her accommodation matches that of her big sister the Oyster 485 and her centre cockpit and spacious deck saloon make her a delight to live aboard. She also has two heads and showers aboard along with a work room which is equipped with a workbench. Her sailing performance is enhanced by her fin keel with a high profile bulb that makes her stiff and responsive. She has proven to us time and time again that no matter what the conditions she will keep us safe and comfortable. We have adopted Cygnus and she has now become part of our family.